Islam Around Us: Suspected Israeli revenge killing of Palestinian triggers clashes. Suspected Israeli revenge killing of Palestinian triggers clashes. 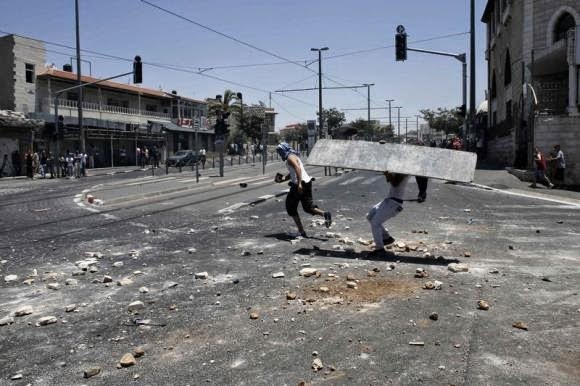 JERUSALEM | Reuters | 02 July 2014 : : The body of an abducted Palestinian youth was found in Jerusalem on Wednesday, raising suspicions he had been killed by Israelis avenging the deaths of three abducted Jewish teens. Palestinian President Mahmoud Abbas accused Jewish settlers of killing Abu Khudair and demanded that Israel "mete out the strongest punishment against the murderers if it truly wants peace". Israeli Prime Minister Benjamin Netanyahu urged police "to swiftly investigate who was behind the loathsome murder and its motive." He called on all sides "not to take the law into their own hands." The United States also condemned the killing, with U.S. Secretary of State John Kerry calling it a "despicable and senseless abduction and murder." He urged both Israeli and Palestinian officials "to take all necessary steps to prevent acts of violence and bring their perpetrators to justice." Police said they had found a body in the wooded outskirts of Jerusalem. Abu Khudair's father told Reuters the force had told him the body was his son.